And there's nothing new under the sun, said one wise sage. In the case of long serving metal band Leaves' Eyes there is something new. Co-founder and vocalist Liv Kristine is out as the lead female vocalist; Angel Nation vocalist Elina Siirala is in. Sign Of The Dragonhead, the band's seven studio, album is the first with Siirala on vocals. I should know better or, at the very least, have a better memory. While I'm a sucker for symphonic melodic power metal, and certainly don't mind female vocalists (though they seem all the rage these past two decades), I forgot that Leaves' Eyes include a specific male vocalist to do death vocals. Alexander Krull's (Atrocity) nasty and annoying growling appears on most every song. Though over the years I adapted to ignoring death vocals, when they are this persistent, Sign Of The Dragonhead doesn't make for a pleasant listen. Nevertheless, the Leaves' Eyes sound returns with it's familiar trademarks: operatic female vocals, bombastic arrangements combining riffage and symphonic synth orchestration, some spry guitar solos, and a touch of folk/celtic nuances throughout. Then there's the familiar lyrical themes revolving around Nordic mythology and Vikings in general. It all makes for a grand and pompous soundscape. Setting aside the myriad of tragic death vocals, some of the better songs come when Leaves' Eyes injects some accessible rock groove into their symphonic power metal. Good examples come with Shadows In The Night, Riders In The Wind, and the quite catchy Across The Sea. In the end, Sign Of The Dragonhead is merely Leaves' Eyes doing what they do best: epic symphonic and melodic power metal with contrasting operatic female vocals and male death vocals. If you liked them before, you will enjoy them again. Simple. 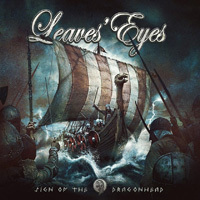 Sign Of The Dragonhead is merely Leaves' Eyes doing what they do best: epic symphonic and melodic power metal with contrasting operatic female vocals and male death vocals. If you liked them before, you will enjoy them again. Simple.